Analysts say that the company’s smartphone business was not as lucrative because of higher marketing costs. QUARTERLY EARNINGS AT Samsung fell for the first time in two years as sales of smartphones and tablets slowed in developed countries. 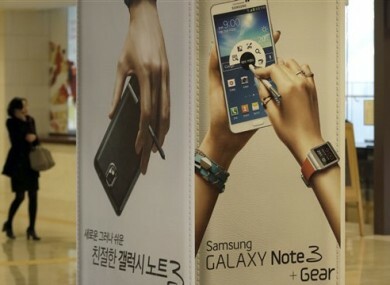 The South Korean company estimated an operating profit of 8.3 trillion won (€5.7 billion) for the final three months of 2013, a 6 per cent decline over a year earlier. The result was lower than forecast by analysts and an 18 per cent drop from the third quarter. Sales rose 5 per cent to 59 trillion won (€41 billion). Since the last quarter of 2011, Samsung’s operating income has increased every quarter, peaking at 10.2 trillion won (€7 billion) in the July-September period. The fourth quarter performance shows that explosive growth in Samsung’s lucrative mobile device business has come to a halt. It will release its net profit result for the fourth quarter later this month. Analysts said Samsung’s profit fell because its businesses supplying advanced displays and chips for iPhones and Galaxy smartphones posted smaller profit. They said Samsung’s smartphone business making Galaxy smartphones and Galaxy Gear smartwatches was not as lucrative as before because of higher marketing costs. “It’s an earnings shock,” said analyst James Song at KDB Daewoo Securities. “The profit at mobile communications business must have been much lower than expected although it’s likely that Samsung gave bigger bonuses to employees.” Song had estimated 9.3 trillion won of operating profit for Samsung. Samsung Electronics’ smartphone business also faces more competition in China. Starting next week, Apple is scheduled to begin selling iPhones through China Mobile, the world’s largest wireless carrier, a move that could threaten Samsung’s growth in the smartphone market. Samsung held 21 per cent market share in China’s smartphone market during the third quarter, up from 14 per cent a year earlier, while Apple’s share declined to 6 per cent from 8 per cent, according to research firm Canalys. Email “Samsung earnings fall as mobile growth slows down”. Feedback on “Samsung earnings fall as mobile growth slows down”.